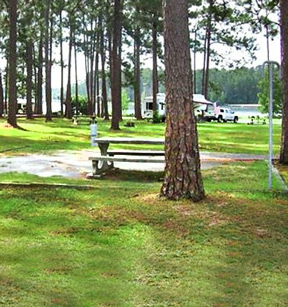 Offering 44 sites in a lakefront campground for tents and RV, Laura S. Walker State Park offers a scenic, quaint escape. Providing hot showers and laundry facilities, the park is sure to make everyone feel right at home. A pioneer campground is available for groups. Sportsman's cabins are situated near the lake and offer accommodations for six in each cabin. Dogs are allowed in select cabins with advance notice and pet fee.